Bonair Winery farms 40 acres of estate vineyards in the Rattlesnake Hills of the Yakima Valley to ensure the quality of the grapes that go into make our wine. 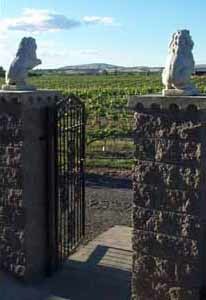 The Château Puryear Vineyard is located on the south end of Bonair Road and the Morrison Vineyard is located on the north end of Bonair Road. The Château Puryear Vineyard is our home vineyard. It was first planted in 1980 to Chardonnay, Cabernet Sauvignon, and Riesling. It has since been expanded to include Pinot Noir, Touriga, Gewurztraminer, Petite Verdot, Merlot, Malbec, and Cabernet Franc. 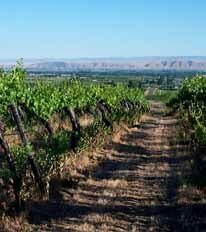 The vineyards are located at an elevation of 900 feet on the bench lands of the Rattlesnake Hills on the rich Warden Soils, highly prized for apple and cherry production in the past. This area has only recently become available for premium wine grape production with the demise of the apple industry. The Warden Soils were formed about 13,000 to 20,000 years ago on lake deposits left by the Missoula Floods. They have since been covered by a fine silty loam. These soils are alkaline and rich in lime. They naturally limit production to less than four tons per acre. The Morrison Vineyard was planted by Joe and Sid Morrison in 1968. It is the oldest vineyard in the Rattlesnake Hills. We purchased the vineyard in 2001. Originally, it was planted to Cabernet Sauvignon and Riesling. Future plans call for planting all five Bordeaux varieties. Located at 1200 feet elevation, above the level of the Missoula Floods, it is on the Harwood, Burke, Wiehl silty loams. The Ellensburg formation, a remnant of the ancient Yakima River, forms the cobbly base for this soil. Naturally low in nutrient, these vineyard struggle to produce three tons to the acre. Click on the Rattlesnake Hills logo to find out more about the unique climate and soil characteristics found only in the Rattlesnake Hills. Arrange a private tour of our vineyards. Advanced notice is required in order to make personnel available.